The Willamette Valley has long been known to grow some of the best fruit in the entire world. The Marionberry was originally called "No. 256". 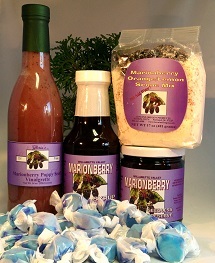 It was created at Oregon State University located in Marion County, Oregon, hence the name Marionberry. It is a horticultural cross between several cane berries; the Blackberry, Red Raspberry, Olallie Berry and Texas Dewberry, to name a few. This berry is considered to be the CADILLAC of the Blackberry World. We have taken this berry and created the most extensive and exciting product selection you will find anywhere in the world. While other jam companies make jam, we make everything from Marionberry Chutney to Marionberry Vinaigrette and beyond!